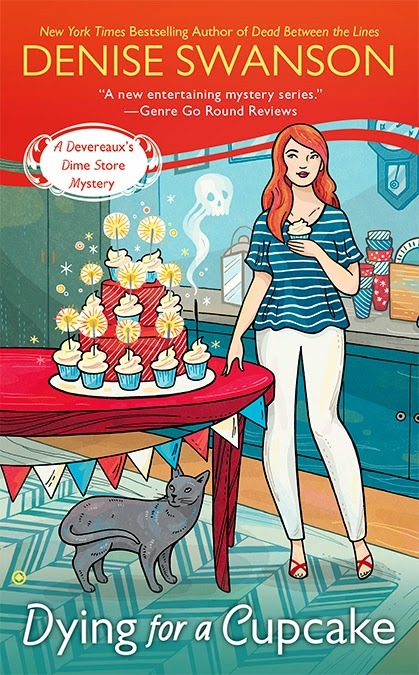 Dying for a Cupcake by Denise Swanson features Devereaux Sinclair. Hi! My name is Devereaux Sinclair. I own an old-fashioned dime store. Something you may never have seen if you’re under the age of fifty. But when the one in my hometown of Shadow Bend, Missouri went up for sale, I decided to buy it and keep the vintage feel. I had just found out that I needed to spend more time with my grandmother, Birdie who was starting to have some memory issues, so it seemed like the perfect solution. I quit my job as a financial consultant, saved the dime store from turning into a Rite Aid or CVS, and settled down to be a small-town shopkeeper. I was expecting to be a little bored with the slower pace and the more sedate lifestyle, but boy was I wrong. The past six months has gone by in a whirlwind. First, I was accused of murdering my high school sweetheart’s fiancée. Then my BFF Boone St. Onge got into hot water, and even the local book club that meets in my store had a problem. Who knew that a poet could be so controversial? Of course, it wasn’t his rhymes that got him into trouble. On the bright side, I met a really yummy U.S. Marshall named Jake Del Vecchio, made up with my old boyfriend Noah Underwood, and when we got some great news about my father, Gran’s memory started to improve. Things were finally looking up, when Kizzy Cutler, decided to hold her company’s cupcake contest in Shadow Bend during the July Fourth weekend. Kizzy threw money around like cupcakes were made of dough instead of batter and paid me handsomely to remodel the top floor of my store in order to use it for the contest. Although we squeezed in a few sizzling phone calls, I was sad that both Jake and Noah were out of town for the festivities. Still, I had my hands full with the contest and wouldn’t have had much time for either of them anyway. Their absence was probably a good thing for another reason because I have a sneaking suspicious they both would have been ticked off that the new smoking hot fire chief was hanging around the store. Hey! I didn’t encourage him. At least, not very much. The cupcake contest did have a few little hiccups. Like the fact that someone seemed determined to kill its sponsor. Finally, I got sick of having to save Kizzy from whoever was trying to murderer her and along with my BFFs, I solved the mystery of who was trying to ice the Cupcake Queen. Just when I thought all the drama was over with, Jake arrived back in town with a surprise. And not the good sparkly kind either. You can read more about Dev’s adventures, in Dying for a Cupcake, the 4th book in the Devereaux’s Dime Store series, published by Penguin. The first book in the series is Little Shop of Homicide. Books are available at retail and online booksellers. About the author: A former school psychologist, New York Times bestselling author Denise Swanson spent twenty-two years working in the public school system. She realized her experiences were actually excellent research for mysteries. Denise also writes the Scumble River mysteries. Dying for a Cupcake sounds like a fun read! I own Little Shop and Dead Between the Lines. I'm looking forward to adding Dying for a Cupcake to my home library. These stories are a fun read and provide me with a lovely escape from daily life. Eagerly awaiting the new book!